Is there anything Helen Mirren can’t do? With Eye in the Sky she does nothing less than show us the ways of modern warfare. Did you read in your daily newspaper that a top ISIS operator had been erased? This movie tells you how. It is a first rate thriller delivered by a good cast that startles audiences with the details of control by technology. On one hand, we watch that extraordinary technology unfold; on the other, we are caught up in the fictional story built around that new science. Both are frightening. As new as drone warfare is, there are no rules written or implied to govern it, no precedents to interpret because there simply are no precedents. We have never before been able to position a functional camera inside a house in the Middle East while controlling it from a base in Nevada. 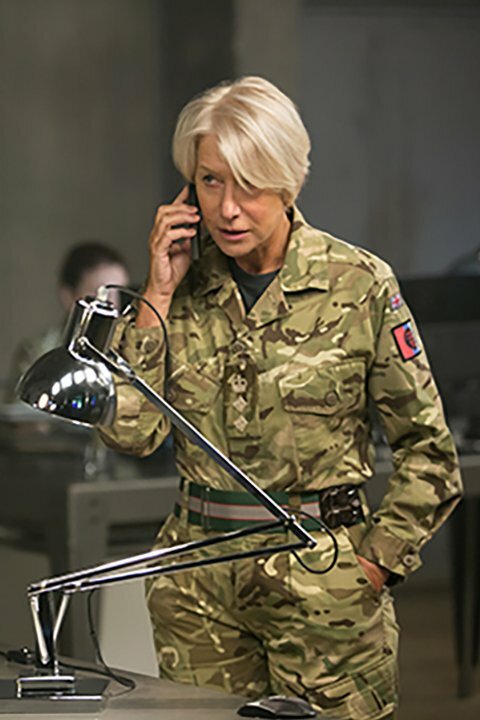 Colonel Katherine Powell (Helen Mirren) is the officer in charge of following up on intelligence that says that #4 and #5 on the terrorist list are arming a suicide bomber in a small house in Kenya. She is in London; the drone operators are in Las Vegas; the pilot with a serious conscience (Aaron Paul) is airborne. Their arguments unfold through a multinational telephone hierarchy. Those conversations show us the confusion that attends the deadly new science and the attendant politics. Who will take responsibility for giving the final go ahead? We are in the new world of war. Their mission: confirm identity, decide between capture and kill, obtain legal clearance, and guess at civilian casualties and collateral damage. All of this will unfold in a country that is not our enemy and for which there are no rules of engagement. The confusion comes to the audience in a high tension handoff by actors who convey the unique challenges of the new warfare. And then the inconceivable new ingredient: if they make the wrong decision will it hand a propaganda victory to the terrorists on YouTube? The cast does a fine job of grappling with the emotional, political and moral implications of modern warfare. Helen Mirren, ice cold and grand as the Colonel, knows what must be done but her eyes show inner conflict. Aaron Paul touches our hearts. Director Gavin Hood implants troubling questions that linger. Does the new face of war include the right to blow up a building in a country that is not our enemy? Will remote warfare mean fewer casualties for the bombers and the bombed because it can be targeted? Is there no chance at all of finding an alternative for international disputes in an era that promises eventual nuclear annihilation? How long before a terrorist hits us with this kind of a drone bomb? As is our custom, we invented it and used it first, but it will come back at us before long. This is a gripping thriller that plants the seeds of future trouble. This review was posted on April 2, 2016, in Drama, Thriller, Uncategorized, War. Bookmark the permalink.